I have recently worked for a large investment bank where I was part of the architecture/development-tooling team and where I spent a lot of time trying to solve the increasingly harmful problems of software by introducing DevOps. It is also well-known that people resist change. It should therefore not come as a surprise that they will resist changes to the software delivery process, a process that has a huge impact on the way they work day-to-day. 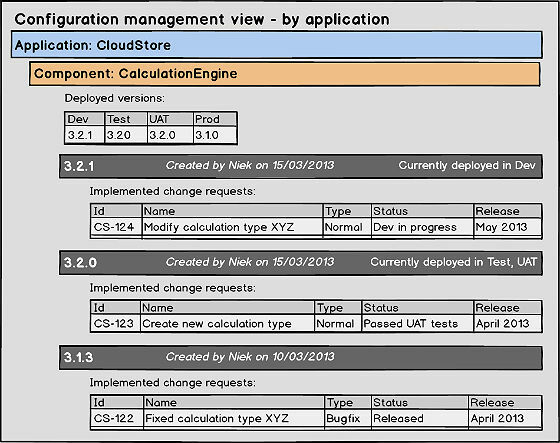 We decided to create three levels of configuration items (CI's): on top the level of the business application. Business applications can be seen as the "units of service" that the IT department provides to the business. Below is the level of the software component. 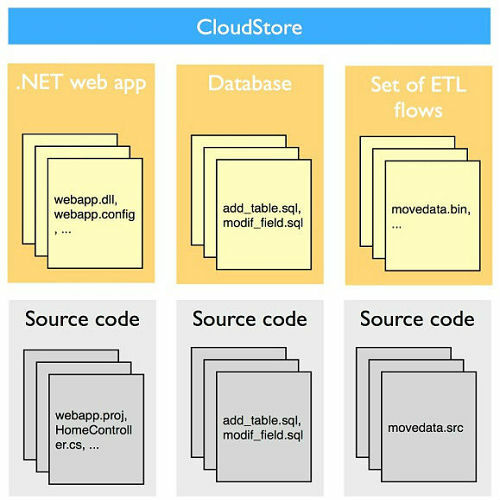 A software component refers to a deployable software package like third party application, a web application, a logical database or a set of related ETL flows and consists of all files that are needed to deploy the component. And on the bottom the level of the source code that consists of the files that are needed to build the component. CI's are not static. They must change over time as part of the implementation of new features and these changes must be tracked by versioning the CI's. So you could see a version number as a way of uniquely identifying a particular set of features that are contained within the CI. Once this structure was defined, the complete list of business applications was created and each application was statically linked to the components it was made up of as well as to the development team they were maintained by. 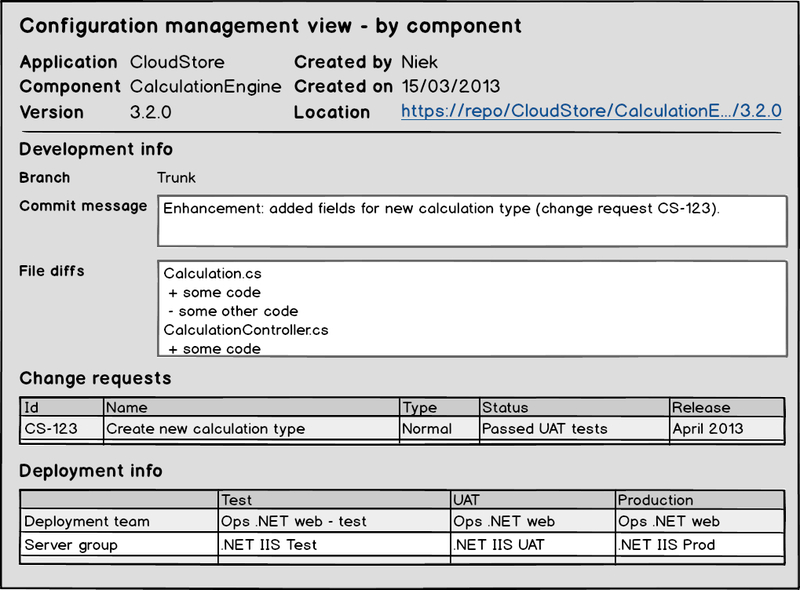 Change requests that were created for a particular application could not be used anymore to change components that belonged to a different application. And deployment requests that were created for a particular application could not be used anymore to deploy components of a different application. In these cases a new change request or deployment request had to be created for this second application. 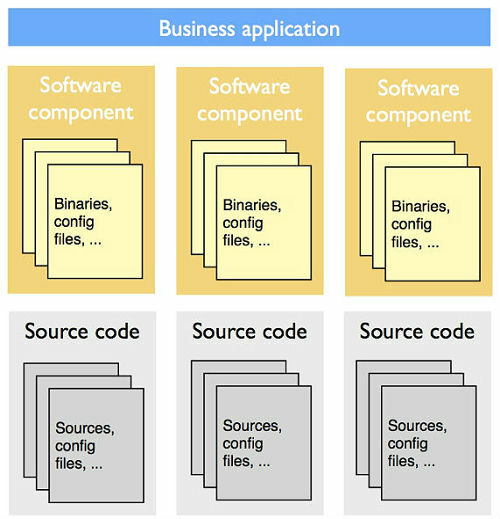 Following the arrows: an application contains one or more software components. 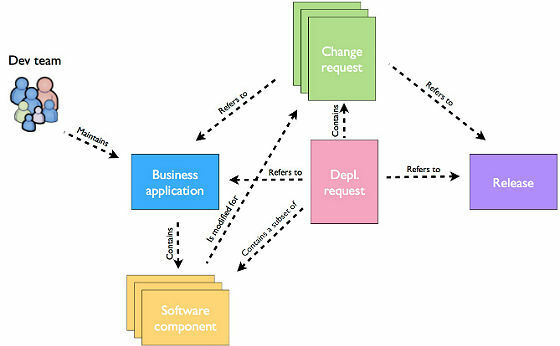 There can be multiple change requests per application and release, but only one deployment request and it is used to deploy one, some or all of the software components. Source code is stored and managed by version control systems. This level is well documented and there is good support by tooling (git, svn, TFS, ...) so I will not further discuss it here. On the level of the components, the files that represent the component (executables, libraries, config files, scripts, setup packages, ...) are typically created from their associated source code by build tools and physically stored in the DML. All relevant information about the component (the application it belongs to, the context in which it was developed and built, ...) is stored in the CMS. Once these rules were agreed, a lightweight tool was built to serve as both the CMS and DML. It was integrated with the build tools in such a way that it automatically received and stored the built files after each successful build of a particular component. By restricting the upload of files to exclusively the build tools (which in turn assure that the component has successfully passed the unit-tests and the deployment test to a development server) at least a minimum level of quality was assured. Additionally, once a particular version number of a component was uploaded, it was frozen. Attempts to upload a newer "version" of the components with a version number that was already present would fail. With this information the CMS was able to calculate some interesting pieces of information that used to be hard to manually keep track of before, namely the team that is responsible for doing the deployment and the logical server group (e.g. "Java web DEV" or ".NET Citrix UAT") to deploy to. Both were functions of the technology, the environment and sometimes other parameters that were part of the received information. As these calculation rules were quite volatile, they were implemented in some simple scripts that could be modified on-the-fly by the administrator of the CMS whenever the rules changed. This ability to do impact analysis when a change request had to be removed from a release was a big deal for the company. One of the dreams of the people involved in this difficult task was the ability to get a complete list of all change requests that depend on this change request. Although it was not actually developed initially, it would not be very difficult to do now that all the necessary information was available in the CMS. The same could be said about including more intelligent consistency checks: it's quite a small development effort for sometimes important insights that could save a lot of time. A much better strategy would be to avoid these dependencies in the first place. And the best way to do this is by simply decreasing the size of the releases which comes down to increasing the frequency of the releases. 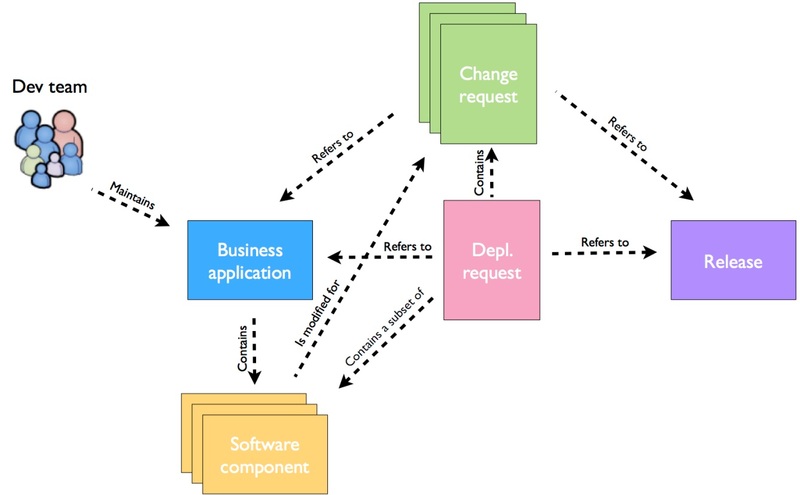 When releases happen infrequently, the change requests typically stack up to a large pile and in the end all change requests are dependent on one another due to the technical dependencies that exist through their components. You remove one and the whole card house collapses. But increasing the release frequency requires decent automation and this is exactly what we're working on! But until the whole flow is automated and the release frequency can be increased we have to live with this problem. If we take this strategy of increasing the release frequency to its extremes we will end up with continuous delivery, where each commit to each component triggers a new mini-release, one that contains a one-step deployment, that of the component that was committed. No more dependencies, no more impact analysis, no more problems! Nice and easy! Nice? Yes! Easy? Maybe not so. Because this approach doesn't come for free. With the batch-style releases at least you could assume that whenever the new version of your component is deployed into an environment it will find the new versions of all components it depends on (remember that most of our features required changes to multiple components). It doesn't have to take into account that old versions of these components may still hang around. 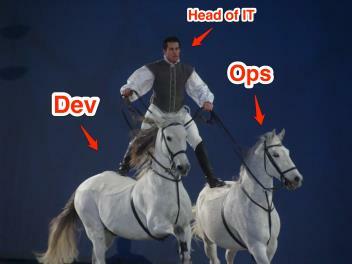 With continuous delivery, this assumption is not guaranteed anymore in my opinion. It's now up to the developer to make sure that his component supports both the old and the new functionality and that he includes a feature flag to activate the feature only when all components are released. In some organizations (and I'm thinking about the large traditional ones with lots of integrated applications) this may be a high price to pay. 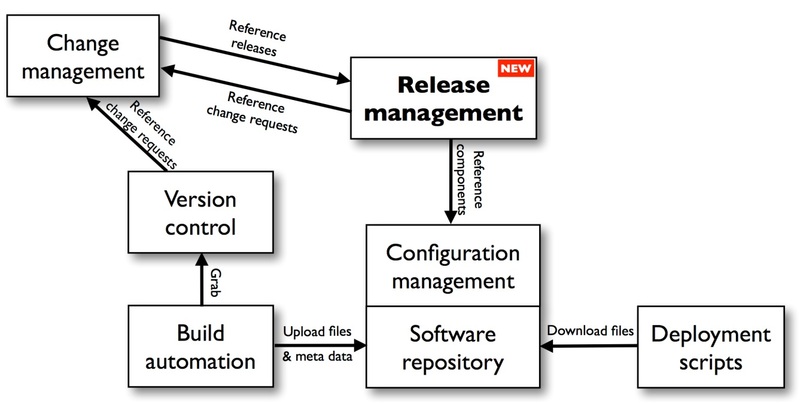 Time now to head over to the second step of the solution: bringing release management under control. As already mentioned, the applications in our company were highly integrated with each other and therefore most of the new features required modifications in multiple applications, each of which managed by its own dedicated development team. Continuous deployment takes another approach to avoid all these problems that are caused by these dependencies: it requires the developers to support backward-compatibility, in other words their component should work with the original versions as well as with the modified versions (those that include the new feature) of the other components, simply because they don't know in advance in which order the components will be deployed. In such a context the developers can do their work on their own pace and deliver their components whenever they are ready. As soon as all the new versions of the components are released a feature flag can be switched on to activate the feature. There is unavoidably a huge drawback to this scenario: in order to support this backward compatibility the developers basically have to keep two versions of the logic in his code, and this applies to each individual feature that is being worked on. This requirement can be a big deal, especially if the code is not well-organized. Once the feature is activated they should also not forget to remove the old version to avoid that the code base becomes a total mess after a while. If there are changes to the database scheme (or other stateful resources) and/or data migrations involved things will become even more complicated. Continuous deployment is also tightly coupled to hot deployment, which also introduces quite some challenges on its own and if the company doesn't have a business need to be up all the time that's a bit of a wasted effort. I found a nice explanation of all the intricacies of such practices in this webinar by Paul Biggar at MountainWest RubyConf 2013. But don't get me wrong on this, continuous deployment is great and I really see it as the way to go but that doesn't take away that it will take a long time for the "conventional" development community to switch to a mindset that is so extremely different from what everyone has been used to for so long. For this community (the 99%-ers ;-)) continuous deployment merely appears as a small dot far away on the horizon, practiced by whizkids and Einsteins living on a different planet. But hopefully, if we can gradually bring our conventional software delivery process under control, automating where possible and gradually increasing the release frequency, maybe one day the leap towards continuous deployment may be less daunting than it is today and instead just be the next incremental step in the process. But until then I'm afraid we are stuck with our orchestrated release process so we better make sure that we bring the processes and dataflows under control so we can keep all the aforementioned problems it brings with it to a minimum. The first step was for the dev team to create a deployment request for their application. This request should contain all the components - including the correct version numbers - that implement the features that were planned for the ongoing release. Each team would then send their deployment request to the release coordinator (a role on enterprise level) for the deployment of their application in the first "orchestrated" environment, in our case the UAT environment. Note that we also had an integration environment between development and UAT where cross-application testing - amongst other types of testing - happened but this environment was still in the hands of the development teams in terms of deciding when to install their components. The deployment request for production would then simply be a merge of the initial deployment request and all "bugfix" deployment requests, each time keeping the last deployed version of a component. Except if it's a stateful component like a database, in which case deployments are typically incremental and as a result all correction deployments that happened in UAT must be replayed in production. Stateless components like the ones that are built from source code are typically deployed by completely overwriting the previous version. Again, the release coordinator would review and coordinate the deployment requests for production, similar to how it was done for UAT and that would finally deliver the features into production, after a long stressful period. For more information on this topic you should definitely check out Eric Minick's webinar on introducing uRelease in which he does a great job explaining some of the common release orchestration patterns that exist in traditional enterprises. As long as there were relatively few dev and ops teams and all were mostly co-located this process could still be managed by a combination of Excel, Word, e-mail, and a lot of plain simple human communication. However, as the IT department grew over time and became more spread out over different locations, this "artisanal" approach hit its limits and a more "industrial" solution was needed. On the tooling side we chose a proprietary tool that helped us industrialize our release management process. 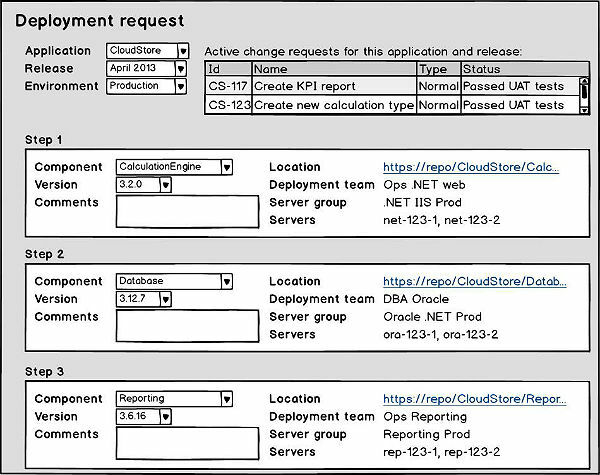 On the deployment date the deployment requests for a particular release can then be grouped into a release plan - typically after all deployment requests are received - that allows to create release-specific handling like adding pre and post deployment steps. And finally during the day of the deployment the release plan will be executed, going over each deployment step of each deployment request either sequentially or in parallel. For each manual step, the ops team responsible for the deployment of the associated component will receive a notification and will be able to indicate success or failure. For each automated step an associated script is run that will take care of the deployment. As part of the implementation project in our company the tool was integrated with two other already existing tools: the change management tool and the software repository. 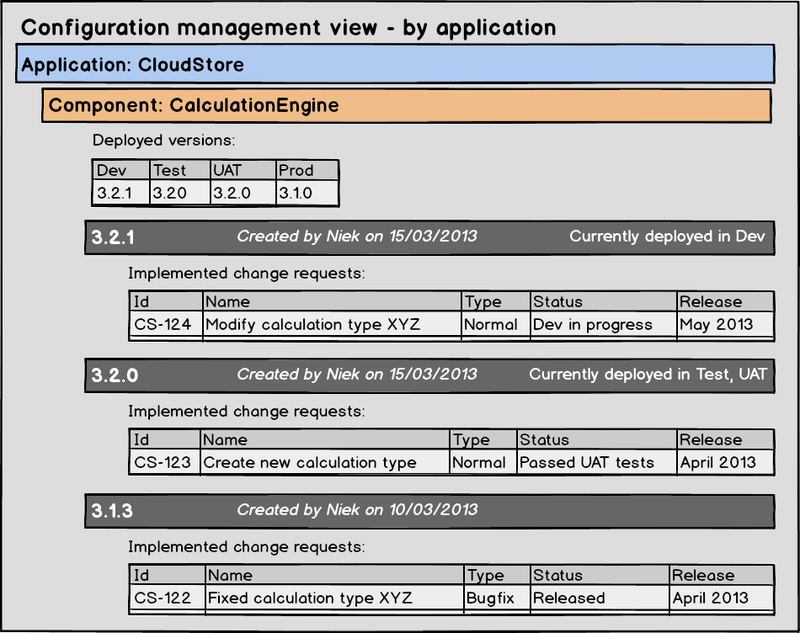 The release management tool was notified by the change management tool whenever a change request (or feature) was updated. 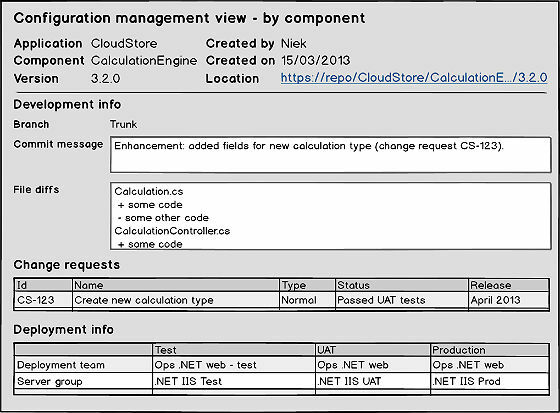 This allowed the tool to show the change requests that applied to that particular application and release directly on the deployment request which made it possible for the release coordinator to easily track the statuses of the change requests and for example reject the deployment requests that contain not yet signed-off change requests. The release management tool was also notified by the software repository whenever a new version of a component was built which allowed the tool to restrict the choices of the components and their version number to only those that actually exist in the software repository. 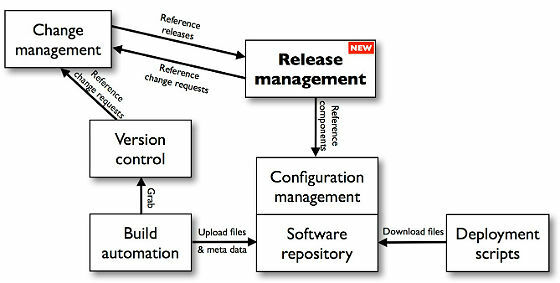 More generally, by implementing a tool for release management rather than relying on manual efforts it became possible to increase the quality of the information - this was done by either enforcing that correct input data is introduced or by validating it a posteriori through reporting - and to provide a better visibility on the progress of the releases. Looks good doesn't it? Of course this doesn't mean that what was implemented is perfect and doesn't need further improvement. But for a first step it solved quite a number of urgent and important problems. It is time now for these tools to settle down and to put them under the scrutiny of continuous improvement before heading to the next level. Niek Bartholomeus has been a devops evangelist in a large financial institution for the last five years where he was responsible for bringing together the dev and ops teams, on a cultural as well as a tooling level. He has a background as a software architect and developer and is fascinated by finding the big picture out of the smaller pieces. He can be found on Twitter @niekbartho and on his blog.